As our part of our counseling, we provide free self-administered pregnancy tests to women who believe they are pregnant. We are also able to provide referrals for a free ultrasound from a licensed medical facility. The test is simple, painless and provides no risk to the mother or baby while enabling the doctor to confirm the pregnancy and development stage of the baby. Located in a city of multicultural demographics, we serve women and mothers from all five boroughs within New York City. In an effort to connect with everyone who comes to us in need, we are able to offer multilingual, supportive counseling through the diversity of our care consultants. 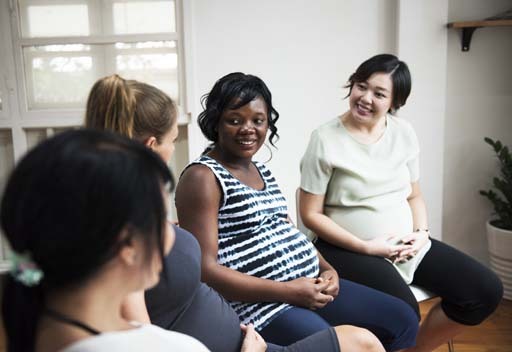 Our program provides tangible support to women and couples who are expecting a baby. Pregnant women can obtain needed maternity clothes throughout their pregnancy. Prior to the baby’s birth, the mother-to-be is gifted with a Welcome Kit containing the basics needed to bring home her newborn. Following the birth, mothers can receive additional clothing for her infant and other children along with diapers, wipes, bottles, strollers, highchairs, etc. as available. All these items are offered through generous donations of individuals and organizations within the community who want to assist mothers and families in their community. By providing families in need with these items, we are able to eliminate some of their financial strain. Knowing we are here empowers the expectant mother to choose life. We’re here to listen, care and help! Someone is always available to answer a call from an expectant mother, father-to-be or family member. Simply call our 24 hour hotline at 718-463-1810.